For many years dealers have relied on service absorption to measure the success of their service departments. Today service absorption is still one of the most frequently cited fixed ops metrics at 20-group meetings. In a nutshell, service absorption is service department profit after all the fixed expenses for the dealership are covered. As dealers rely more on service departments to carry store profitability, they look to their service absorption number to gauge their success. The higher the number, the more profitable they are. I believe this focus on service absorption is very limiting, and even dangerous to a dealership’s long-term success. Service absorption as a metric is outdated, ineffective and should be replaced with a metric that provides a far more accurate picture of true service revenue potential. The first issue I have with service absorption is that it’s composed of two unrelated measures and does not speak to a store’s achievement relative to its potential. Service profits are not substantially driven by store fixed costs. Most dealership fixed costs support vehicle sales, not service, so there is no reason to expect correlation between the two metrics. Therefore, the metric itself does not provide any guidance for how to optimize service profitability. This underlying premise of comparing service profits and store fixed costs represents an archaic view of automotive retailing. Once upon a time, dealers could count on substantial warranty work and sufficient in-warranty customer pay business from new vehicle sales. The more cars that dealers sold, the more service work they got. Although new vehicle sales are near an all time high, today’s vehicles are higher quality and require less maintenance. For dealers, this means less warranty work, less standard maintenance work and more replace-than-repair work, all in an environment where there is increased aggressive competition from independent aftermarket chains. Service absorption is limiting because it doesn’t measure how much of your business is being lost to the competition. For example, there are certain brands like Subaru, Hyundai and Kia that have done really well in sales in the last six to eight years. In fact, their sales have expanded faster than their dealership operations have grown, so these dealers have relatively low fixed costs and not a lot of service capacity. As a result, these dealers have high service absorption numbers and feel like they’re doing great. The reality is that because they don’t have enough service capacity, they are losing a lot of potential revenue to independent repair shops. This in turn leads to lower brand and dealership loyalty and retention rates, which is not good for future business. We can already see this trend happening. From 2010 to 2017, one- to three-year-old units in operation increased 48 percent. However, franchise dealership service and parts sales increased just 41 percent. So franchised dealers lost share, indicating lost connectivity to consumers and vehicles, which is becoming increasingly important as new vehicle sales slow and margins decline. The fact is, achieving 100 percent service absorption doesn’t mean that your store has achieved its service potential. Today’s franchise dealers only capture 20 to 25 percent of revenue potential from their Units in Operation (UIO). I would argue the focus on service absorption in part contributes to these results because many dealers are only focused on covering fixed costs, rather than competing on each revenue opportunity. This leads to tweaking service marketing and operations, rather than driving the more fundamental change required to wrest dollars from aftermarket chains. Instead of focusing on service absorption, think of ways you can maximize service revenue from the vehicles you have sold. The best way to do this is to measure service revenue per units-in-operation (UIO). This metric is easy to calculate. Take the total number of cars you have sold in the last six years. Let’s say your dealership averages 100 cars a month, so over six years that’s 7,200 vehicles. 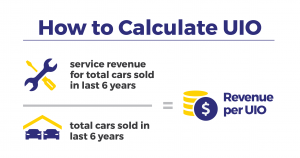 Now, calculate the service revenue you are currently getting from all those cars. Divide that figure by 7,200 to arrive at your revenue per UIO. Service revenue per UIO is a more insightful diagnostic tool than service absorption, giving dealers a clearer picture of their strengths and weaknesses. Are you having a retention problem or are you having a problem getting the most dollars out of every car you see? Are you having trouble getting customers to come in for their first service, or is the problem that your customers are dropping off after they are out of warranty? Not only does this metric better represent the true service potential for the store, it facilitates more meaningful cross-store comparisons and diagnostics. Are underperforming stores not seeing enough VINs? Not seeing them with enough frequency? Not yielding enough revenue per VIN? Which operations are not being performed with enough frequency? With such a view, additional investments in marketing, service lane technology or loaner vehicles are not measured as an expense, but against their impact on incremental service gross profit. With only 25 percent service revenue capture, as a dealer you have the opportunity to dramatically expand store profitability no matter what happens to new vehicle profits—but only if you are willing to look beyond service absorption. To view this article in Fixed Ops Magazine, click here.